Brand new & High quality! The plastic cover can be removed, retrofitting garbage bags to facilitate cleaning. The lid is made of the plastic material. 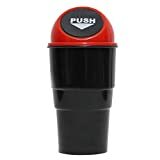 Suitable to arrange in a vehicle cup holder or door, ensure safety placing.